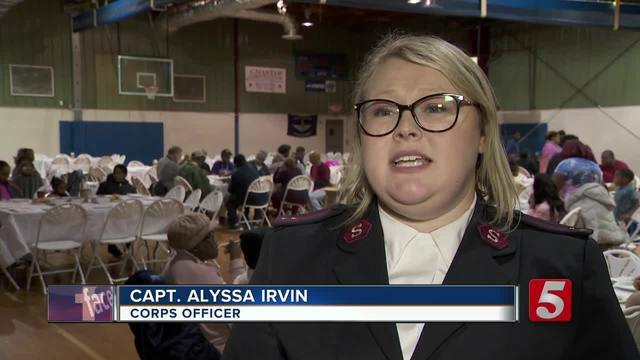 The Salvation Army served its first of three holiday meals, giving families a chance to celebrate Thanksgiving a few days early. The dinner gives families a chance to celebrate Thanksgiving a few days early, and they were also able to meet Casey since he served dinner as well. Instead of using a buffet line, families were served at their table Monday night to encourage them to talk with one another. "We believe community is important. Talking with each other and sharing your life with each other and to say thanks to each other; to tell each other about your life and what you're thankful for this holiday season. That's what its all about," said an organizer. The second meal will be held Tuesday at the North Campus at 5:30 p.m. and the third will be Wednesday at noon at the South Campus.